BAT is aiming to drive adoption through their web browser – the “Brave” browser. A great product, but getting the users to adopt a new browser and change their habits on that level is quite a challenge. So one key difference is that users who will participate in the Zinc protocol ecosystem will gain more rewards within the apps they already use. Basically, apart from having to install the Zinc wallet app, where users choose what information to share with advertisers, they continue doing everything as they do now, and so does the rest of the industry. Another key difference between Zinc and other projects is that the Zinc Protocol does not aim to cut out the middleman. A lot of projects are claiming that the problem is the middlemen and if advertisers and publishers had a way to work together those problems would be solved, which in concept is a great idea, but in practice we think it’s a bit naive. Most of the game publishers rely on advertising to achieve two main goals: the first, monetize and build their businesses; the second, keep players engaged in the game by offering them in-game rewards. This is the basic tradeoff in the free-to-play economy: the users watch ads and in return get rewarded with coins, lives, time, etc. This process today is very inefficient due to fraud, lack of reliable user data, lack of user identification, lack of transparency, etc. Zinc protocol will improve this process significantly by reducing fraud, providing first-party user data, and increasing transparency. 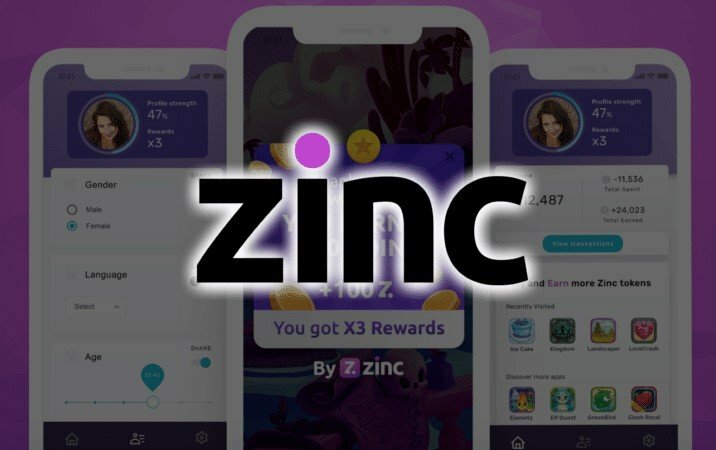 The Zinc protocol will continue to support the free-to-play economy, without the excessive amount of ineffective advertising. Today, if a publisher needs to push ten ads per session to support his app and have a positive ROI, with Zinc Protocol, probably two or three ads will be enough. All this while continuing to use the same in-game currency and rewards. The implementation of the GDPR puts a strict requirement for consent when sites and apps use 3rd party tracking cookies. This has led to comments within the industry which proclaim that a consent model is “unworkable”. How do you think the future of digital advertising will play out in light of the GDPR? Is reward-based consent the only way to remain compliant? The rewards are one part, the consent is another. Rewards improve the experience, keeping users motivated and actively engaged in their online experiences. Consent is the highest level of user permission a user can give to allow the use of his data. Consent implies knowledge & understanding – if you do not know, how you can give consent? This is the exact point that sets apart regulation (such as the GDPR) from real life: users need to actively care and make time to explore the data that the advertising ecosystem uses to follow, target & analyze them – which is complex and difficult, and all they get in return is supposedly better ads, which they want to ignore anyways, so how is this supposed to work? In the Zinc Protocol ecosystem compliance is enabled by decentralization (users are the only ones who can determine who has access to what part of their information), it will relieve publishers and app developers from the responsibility of managing the user data, while providing the advertisers with first party, high quality data that the users themselves chose to share, so they don’t have to worry about regulation changes such as being GDPR compliant. Zinc will be paid out as rewards for users, but also potentially as revenues to app publishers. How does Zinc plan to ensure that the token retains value outside of the ecosystem for publishers, or anyone else who wants to exchange ZINC for fiat? Zinc tokens are intended to support the ecosystem’s ‘attention-economy’ and make the token inherently valuable. Its exchange drives the transactional economy between publishers and app developers, advertisers, users, and ad networks. As long as the transaction of attention is at the heart of th advertising ecosystem, the Zinc token will remain valuable, as it will allow the exchange of attention-per-experience in a way that wasn’t even possible before. The value of the Zinc token will be determined by the number of users who join the ecosystem and store Zinc tokens on their wallets and the number of partners (publishers, advertis, rs and ad-networks) that are part of the ecosystem + the amount of transactions that are made using Zinc tokens. We work to ensure that all of this parameters will increase in time at a steady growth rate by setting up quality partnerships with leading adtech players. How does Zinc plan to attract new users, publishers and advertisers/networks to the platform? 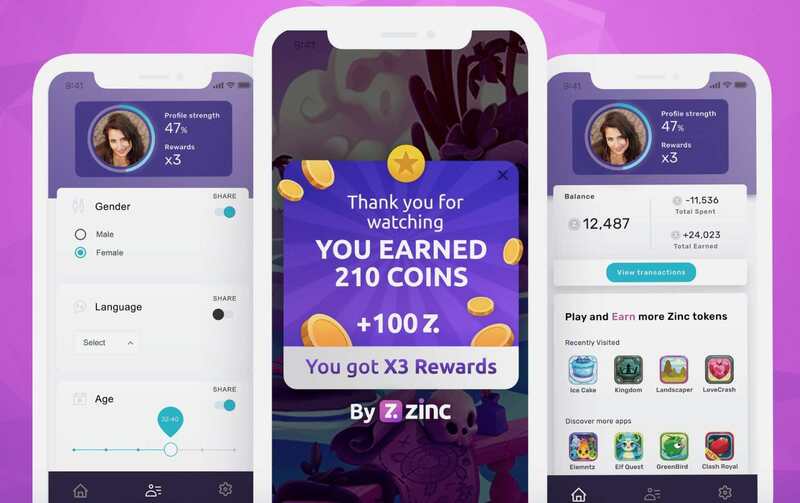 The initial user acquisition for the Zinc Wallet App will be done via Rewarded Video ads, one of the most effective formats in mobile advertising, where users can watch an ad and get some form of in-app reward, usually in the form of another chance at playing the game. This type of campaigns is something that our team is experienced in, and something that makes sense as the audience we’ll be targeting through this channel is highly engaged users, accustomed to being rewarded for viewing ads – who will want to maximize the in-app perks they get. Allowing publishers & developers to monetize effectively; allowing them also to comply with data privacy regulations such as GDPR; allowing Advertisers to audit and verify the validity of their audiences and make their ad spend more effective. We have a few strategies for onboarding partners: from referral programs to advisory groups, direct brand partnerships and partnerships with mediation platforms. We feel everyone has a potential to benefit from joining the Zinc Protocol ecosystem, with very little effort on their side with the hurdles of adoption of a new technology. You and your team have a strong background in the ad-tech industry. How did you come to the idea of applying blockchain to the digital advertising sector, and why blockchain? Being a mobile gamer, I suffer from ad-overload just as much as an app user. On a professional level, I was always passionate about the idea of users taking a more active role in the advertising game and had a few ideas on how to do that in a way that will also help mitigate some of the most painful problems in the ecosystem. About two years ago I started researching blockchain technology and realized it has the potential to provide a technological solution to several of the unsolved issues – creating transparency and credibility across non-related partners in a way that was almost impossible before, allowing users to control their data, providing an accessible mechanism of value exchange, etc. So, slowly but surely, I started developing the concept of Zinc together with a team of passionate enthusiasts, based on the understanding that creating a decentralized governance using blockchain technology and a custom token will allow any partner in the ecosystem to work using the same protocol while preserving business independence, allowing players to add capabilities such as reward mechanisms on the publisher side, and verifiable audiences on the advertiser’s, providing them with new ways to increase transparency and improve monetization. What are the next steps for Zinc moving towards the ICO? We all know the market is down and going through an important transition phase that will take some time to define, I see it as part of the maturity process of the field. But the Zinc team is dedicated and is continuing to build the protocol and develop the Wallet App to make sure we keep up with our development goals and roadmap. Also, we are investing efforts in engaging with worldwide potential partners that will be announced soon, both from the online and mobile advertising ecosystem and from the crypto community. Over the past month, we’ve received several inquiries from financial companies and people asking if our private token sale was still on – the answer is yes! We are currently on the private pre-sale of the Zinc tokens.